OmniAire 2200UL HEPA Negative Air Machine by Omnitec Design Inc. The OmniAire 2200UL is a popular, full-sized negative air machine with HIGH/LOW airflow settings which produces 1000 or 2000 CFM and weighs only 137 lbs. 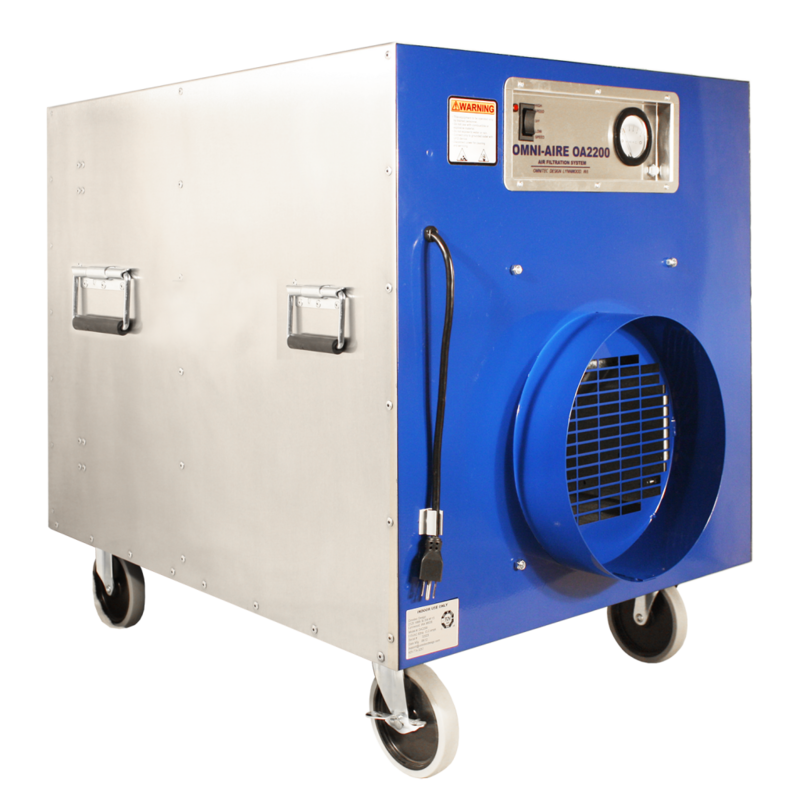 OmniAire 2200UL HEPA air machines are used to clean the air as well as create positive or negative air pressure containment areas on jobsites, in confined spaces, mold, asbestos, and lead abatement or remediation, commercial or factory sites, medical facilities, and many other places. With numerous optional filters, the OA2200UL is suitable for a large array of jobs from light construction, to tasks that require true 99.99% HEPA efficiency. 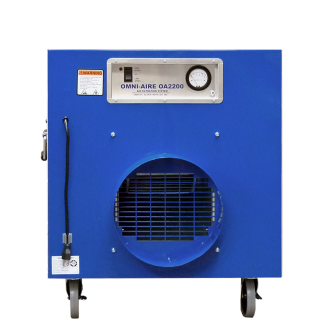 OmniAire 2200UL machines have an easy to sanitize powder coated aircraft-grade aluminum housing, designed to last job after job. 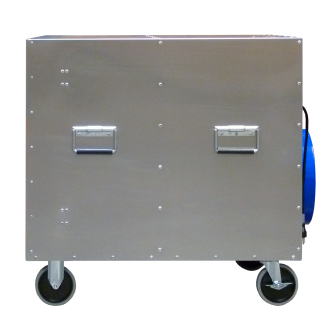 Our housings have a smooth, clean finish and individually riveted construction; with hospital grade non-marking casters allowing for easy portability. All critical seams are silicone sealed before and after riveting to assure that contaminated air will not bypass the HEPA filter. 2200UL machines offer an assortment of options for pre-filters, HEPA filters and accessories. 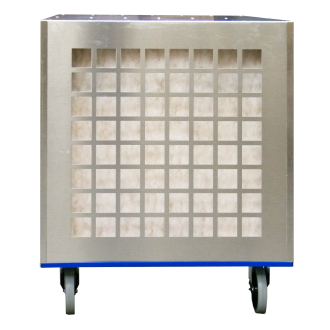 Our standard machine configuration ships with a Dustlok, primary/secondary filter and a 99.97% efficient HEPA filter. Dustlok pre-filters are treated with an anti-microbial additive to prevent growth of bacteria, and a tackifier to increase dust holding capacity. To direct airflow as needed, optional intake manifold adapters can be added to the OA2000V that simply drop into the rear or the machine. Our manifold adapters are made of durable ABS plastic and allow the machines to operate outside of the containment area and connect to the containment with a flexible hose. OdorGuard 600 carbon filters when added optionally provide effective control of odors, VOCs, or fumes. OdorGuard Filters can be installed behind the Dustlok pre-filter for individual projects, or whenever necessary. MERV-14 Bag Filter w/ 9-Pockets, for bulk collection of construction dust and similar contaminants. Bag filters can be installed in conjunction with a bag filter housing module to function as an optional final filter. For your safety, the OmniAire 2200UL machine is OSHA, UL and CSA/IEC compliant for electrical safety. Controls: Power Switch - HIGH/OFF/LOW, Pressure Gauge - 0" to 5"